Majority of my articles are related to government spying, privacy and security issues of your online stuffs and also measures that you can adopt in protecting yourself from being spied on. But, your all efforts will soon be of no use - someone is about to secretly track your every footstep. 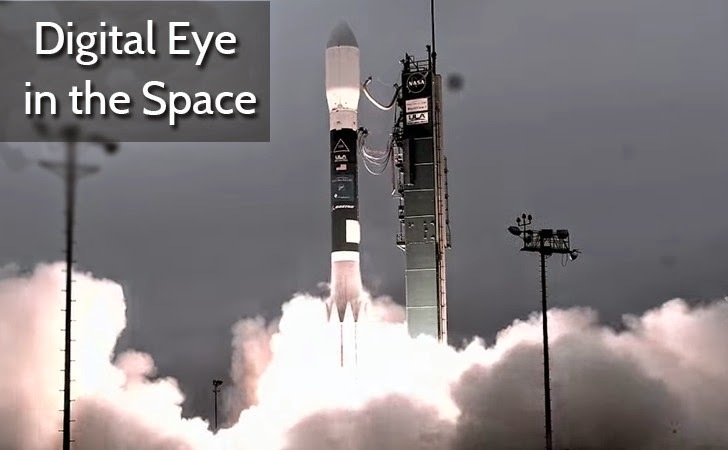 Google will soon get an eye in the space that will be enough powerful to see your face, thanks to the new satellite, WorldView-3 satellite, which is scheduled to launch later today (11:30 a.m. PST) from California's Vandenberg Air Force Base atop an Atlas 5 rocket by Lockheed Martin Commercial Launch Services, according to Motherboard. WorldView-3 satellite is developed by a US-based company DigitalGlobe, one of the world’s leading global content providers of high-resolution earth imagery, supplying most online mapping services to the US government and NASA. Ball Aerospace-developed CAVIS instrument, which stands for Clouds, Aerosol, water Vapor, Ice, and Snow. The Ball Aerospace will monitor the atmosphere and provide appropriate data when atmospheric conditions obscure objects on Earth. Two months ago, the U.S. government imposed legal restrictions on high-detail satellite imagery, although military satellites were free to use higher resolutions. Companies like DigitalGlobe were limited to capturing satellite imagery from 50 centimeters square of ground space per pixel, but are now free to capture satellite imagery up to 25 cm resolution — twice as detailed as the previous limit. Now, today's launch of WorldView-3 satellite will offer DigitalGlobe customers images with four times the resolution of current machines. Its short-wave infrared sensors will also be able to capture images regardless of cloud or smoke cover. It will be able to photograph 680,000 square kilometres every day. In short, it means that regular DigitalGlobe customers including Google, Microsoft, NASA, and multiple US federal agencies such as National Geospatial-Intelligence Agency — played a pivotal role in the seizure of Osama Bin Laden, will eventually be able to zoom in far closer than they are currently able to, and make out much more detail. DigitalGlobe, which already has five satellites in orbit, is currently lobbying the US government for even further relaxation of the resolution restrictions, down to 10 cm per pixel maximum. Google, which recently acquired satellite company Skybox for $500m, also has plans to collect its own high-resolution satellite images in the future, with launch of 24 of its own satellites by 2018, which will capture images of the entire planet three times per day at a distance closer than 1 meter of resolution, and 90 seconds of video at 30 frames-per-second. The company has already launched two of its own satellites via Russian rockets.